Army Military Working Dog (MWD) handlers are responsible for the care and training of his or her service dog, which contributes to combat operations abroad and installation security at home by providing target odor detection (explosive/drug). Service dogs, generally seen as a non-lethal option for neutralizing a threat, also serve as a psychological deterrent during law enforcement operations. Job training for Military Working Dog handlers requires 18 weeks of Advanced Individual Training (AIT) on how to care for, handle and train a Military Working Dog (MWD). The training is in two phases. The first seven-week phase covers on-the-job instruction and teaches police methods and techniques for dog handling. 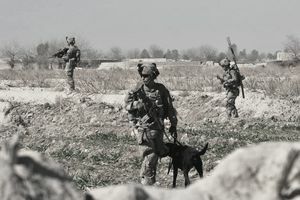 The second phase of instruction is an 11-week course that provides basic instructions on the application of Military Working Dog utilization and employment capabilities. Phase II instructs in basic obedience, controlled aggression, first aid, principles of conditioning, building searches, scouting, detection, and daily care and grooming of assigned MWD. The skills you learn will help prepare you for a career with federal, state and local law enforcement. Many of the jobs skills you learn will also help you to perform civilian jobs that involve working with animals, and general management positions.